On the 1st of March 1901 the Australian Colonies were federated to become the Commonwealth of Australia. With Federation the various Colonial Navies were amalgamated to become the Commonwealth Naval Forces. In the early years after Federation the CNF pretty much made do with the arms and accoutrements handed down from the Colonies as the new Federal Government’s finances were being used elsewhere. It was not until 10th of December 1906 that the Prime Minister, at the insistence of the Defence Minister wrote to the Governor General requesting the he ask Vice Admiral Fawkes, Commander in Chief of the RN Australian Station, if “a sample set of the latest approved Naval accoutrements” could be obtained, by purchase, from the Naval Store Keeper, Sydney1. By 27th December the Governor General was able write to Vice Admiral Fawkes thanking him for his dispatch. It was noted in the margin that the accoutrements were “being supplied direct”. That is where the matter appears to have rested for a number of years as a diligent search of contract records of the period has failed to find any relating to naval accoutrements. At an Imperial Conference in 1909 it was decided the Australia should bear more of the responsibility for naval defences in the region and a significant buildup of naval hardware commenced shortly thereafter. On 10th July 1911 the Crown graciously bestowed the title Royal Australian Navy on the CNF and the RAN, as we know it, was born. 1911 also saw the introduction of Universal Military Training, which meant every able bodied male in the country of certain age groups had to serve in the Cadets then the Militia. 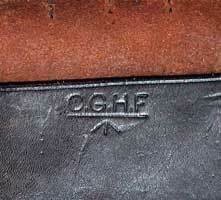 While the Navy’s share of this manpower bonanza was only small, the overall affect of Universal Military Training was to create a huge demand for leather accoutrements, saddlery & harness, which lead to the establishment of the Commonwealth Government Harness Factory (CGHF) in that year2. Not only did the Harness Factory give a much need increase in production capability it also served as a yard stick by which the performance of contractors could be assessed. The Harness Factory was to become central to the story of the Accoutrements, naval, pattern 1901 in Australia. In 1912 the RAN adopted the Short Lee Enfield Mk. III as its standard rifle3 and the prospect of a charger loading rifle in the system may have been the reason that the Accoutrements, naval, pattern 1901 were finally adopted. At the same time it appears that Web Equipment, pattern 1908 was also entering service as it features in some early war photographs of RAN activities. It is believed that the W.E. Patt. 1908 may have been supplied with some of the Navy’s new ships as one such photograph shows a landing party from HMAS Sydney wearing Patt. ’08 in 1915. Photographic evidence also shows that the earlier Accoutrements, naval were still in service during the war and in fact CGHF even manufactured Frogs & possibly other components for this equipment. Effectively the RAN went to war with three different patterns of equipment. The photo at right was taken from the Illustrated War News, issue of 11th November, 1914. The caption states that the photograph shows "the landing party of Australian bluejackets belongiong to the Commonwealth Squadron which, at one stroke, captured German New Guinea on September 11." 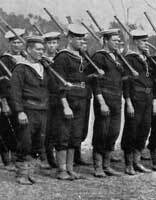 If it does indeed show the men who captured New Guinea then they would be the Naval Reservist part of the Australian Naval & Military Expeditionary Force. This is the only clear photograph KW have found to date of RAN personnel wearing Patt. '01 (that we can use). While research into RAN use of the Accoutrements, naval, pattern 1901 is far from complete, the last mention so far appears to be Commonwealth (of Aust.) Navy Order 282/23 amending The Regulations and Instructions for the Royal Australian Naval Reserve with regard to Depot holdings of various stores, including accoutrements. No documentation on the withdrawal from service of the Accoutrements has been sighted as yet. The illustration shows various versions of the CGHF stamp applied to Accoutrements, naval, pattern 1901. 1. National Archives of Australia file A6662 939855 Governor General’s Office – Correspondence – Request for issue of sample set of Naval accoutrements. 2. National Archives of Australia file MP956/2 394868 Jensen Papers – Defence Production in Australia - The War of 1914-1918 Chapter 5. The Government Factories and Establishments. 3. Commonwealth (of Aust) Navy Order 68/1912. 4. Commonwealth Government Factories Reports (Annual) various, as published on Parliamentary Papers. 5. National Archives of Australia file MP472/1 819358 Small arms accoutrements for HMA Ships, adoption of Webley Scott Automatic pistol.